This chapter discusses the facilitities for storing files and documents on the ServerAtSchool server. 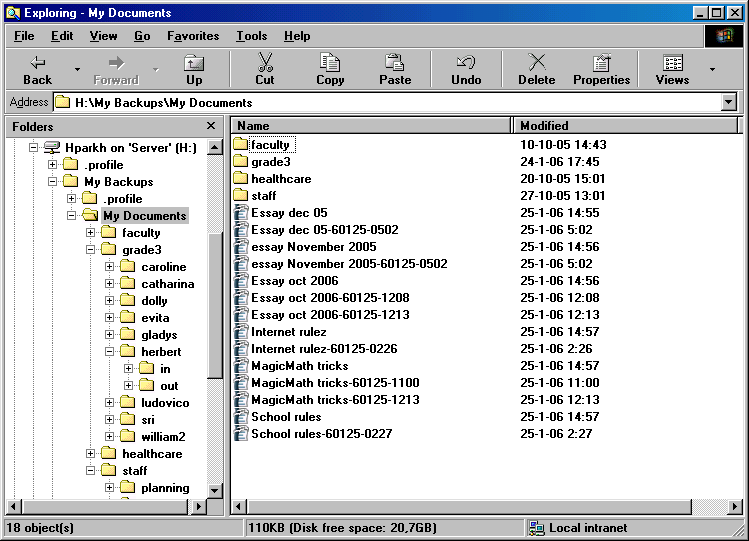 Many application programs store documents and files in the 'My Documents' directory. In ServerAtSchool this directory and hence all files and documents are stored on the central server computer. Section 2. Managing 'My Documents' discusses this directory and the subdirectories it holds. One of the special features of ServerAtSchool is that all files and documents are backed up every hour (during school hours). All teachers and pupils can access their own backups in a safe way and they can also retrieve lost files without help from the local systems administrator or the ICT coordinator. The hourly backup mechanism is discussed in detail in section 3. Restoring files from 'My Backups'. Section 4. Common tasks with documents in a school environment outlines a few tasks that are very common in a school environment. Finally, section 5. Common pitfalls and best practices contains some do's and don'ts based on real world experiences. On a computer that is not connected to a local area network (LAN), all files and documents are stored on the built-in hard disk drive of that computer. This drive is often called 'drive C:' (note the colon; it is part of the name of the drive). Some computers can also use removable disks to store files and documents. These are called 'diskettes' or 'floppy disks' or 'floppies'. They can be accessed via the diskette drive which is called 'drive A:'. When a computer is connected to a server in a local area network, the server can be used to store files, too. This has several advantages. Files and documents are no longer linked to a particular computer but can be accessed from any workstation in the network. It is easier to prevent unauthorised access to files and documents. It is very convenient to organise files and documents on a single file server compared to having to keep track of files on various stand-alone computers. Security issues (anti-virus, backups) are easier to handle on a single server than on many individual workstations. There are also some disadvantages. If the server computer fails, noone has access to their files. If the network is very busy, storing and retrieving files may take longer compared to a stand-alone computer. The file server provides storage space to the workstations in the form of a 'file share'. A file share is "a network resource exported by a server. It usually corresponds directly to a directory on the server which has been exported for network access." (adapted from http://www.obdev.at/resources/sharity/manual/A02-appGlossary.html). A 'file share' (often just called a 'share') has a name. Examples of such share names are '\\SERVER\PROGRAM1' or '\\SERVER\TMP'. Note that the name of the server computer (here: 'SERVER') needs to be part of the full share name in order to distinguish shares with the same name on different server computers. In this notation the server name is always preceded by two backslashes. The server name and the share name proper are separated by a single backslash. This notation is called UNC which is short for Uniform Naming Convention. Many application programs accept the UNC format when storing or retrieving files. Before you can access files and documents on the file server, you need to log on to the network. The procedure is documented in section 2. Windows networking logon in chapter X. Logging in and out. After a successful logon the ServerAtSchool server provides several shares such as '\\SERVER\PROGRAM1' or '\\SERVER\TMP' mentioned before. One share deserves special attention. This is the share that is named after the user name that was used in the logon procedure. That is, if you would logon with user name 'hparkh' there would exist a share called '\\SERVER\hparkh'. This share contains all personal files and documents of user 'hparkh'. All users have their own personal shares. These personal shares are not accessible by other users: user 'lvygot' can not access '\\SERVER\hparkh' and user 'hparkh' can not access \\SERVER\lvygot'. On a stand-alone computer, the various drives where files and documents are stored are identified by a letter and a colon, e.g. drive A: and drive C:. In the ServerAtSchool environment many file shares can also be identified by a letter and a colon. A list of the most important local drives and network file shares can be found in the table below. C: (local drive) Drive C: refers to the (first partition of the first) disk in the computer. This is the place where the workstation's Operating System is stored. Also, necessary drivers and other software could be installed there. On a stand-alone computer this drive also holds all files and documents. D: (local drive) Drive D: usually refers to the CD-ROM drive in the computer. A CD-ROM drive can only be used to read (retrieve) files from CD-ROMs. It is not possible the write (store) files on a CD-ROM. H: \\SERVER\userid Drive H: equates to the user's home directory on the server. userid is replaced with the name of the user that is currently logged on, e.g. \\SERVER\hparkh or \\SERVER\grade3 or \\SERVER\herbert. This drive contains all the user's documents and other data files. 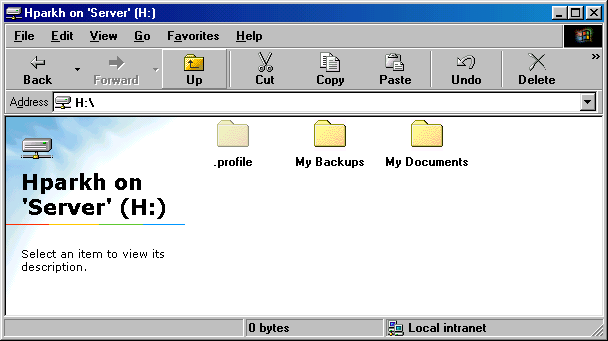 The H: drive also holds the personal settings of a user (the so-called 'profile') and the backup copies of the user's documents and files. V: \\SERVER\TMP This share is available to all users to temporarily store data. It can be used to exchange files between one user and another. However, only the original owner can delete a file. Note that the server itself automatically removes files from this share if they are not accessed for some time (about 4 weeks). Therefore this share should not be used to archive files. The connections between file shares and drive letters are established during network logon (the small black window that flashes by). Open drive H: by double-clicking the appropriate icon. Open (or 'descend into') the directory called 'My Backups'. After you have successfully logged on to the network, you will see an icon on your Desktop labeled 'My Documents'. This icon corresponds to the directory H:\My Documents. This is the place where all your documents are stored. Since this directory is located on the server and not on your workstation, you can access your documents from any workstation. 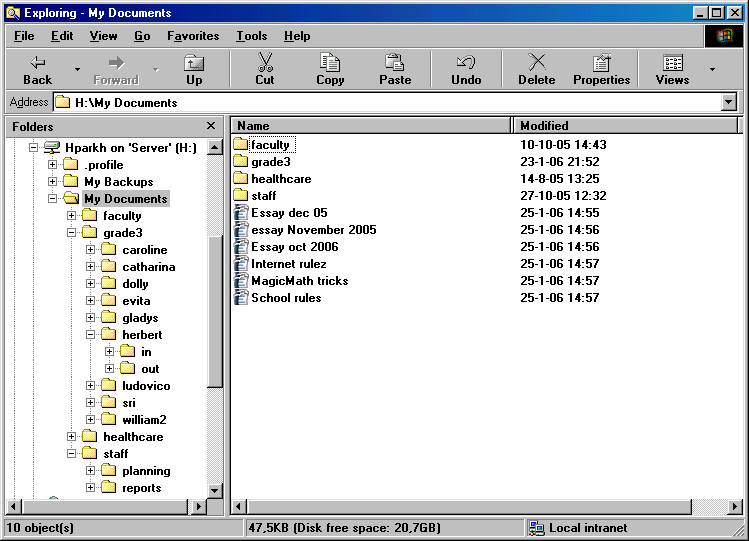 The directory 'My Documents' is also used as a means to access shared documents and files. The details are discussed in section 2.1 Personal documents and shared documents below, using the account for Amelia Cackle, userid 'acackl', as an example. All users have their own 'My Documents'. Depending on the type of user some users may also have access to the 'My Documents' of other users. This is the case with teacher accounts: a teacher is able to access 'My Documents' of the nest account used by her pupils. Also a nest account can access the 'My Documents' of individual pupil accounts that belong to that particular nest. The three possibilities are discussed in section 2.2 Working with documents using a standard user account, section 2.3 Working with documents for pupils using a nest account and section 2.4 Working with documents for pupils using a personal account below. Note that this mechanism works only in one direction: individual pupil accounts are denied access to the 'My Documents' of the corresponding nest and neither pupils nor nests are allowed to access a teacher's 'My Documents'. See section 2. The Exemplum Primary School in chapter II. ServerAtSchool User Manual Overview for more information. All documents and files are stored in 'My Documents', not just the personal ones but also the shared documents and files. The illustration below shows the contents of the 'My Documents' of Amelia Cackle, the head mistress of the Exemplum Primary School. Together with Freddie Frinton, the school's caretaker, Amelia is responsible for everything computer in the school. Therefore, like Freddie, she is a member of the workgroup 'janitors'. Together with Albus Dumbledore, the head master, she manages the school. Both Albus and Amelia are a member of the workgroup 'principals'. Finally, Amelia is also a staff member, and therefore she is a member of the workgroup 'staff' too. The illustration shows three subdirectories (or 'folders') which correspond with these three workgroups: 'janitors', 'principals' and 'staff'. These directories are pre-defined. That is: these subdirectories are created in Amelia's 'My Documents' at the time that her account 'acackl' was made a member of these workgroups. Usually the membership of workgroups is established when the account is newly created. However, it is also possible to become a member of a workgroup later on. These subdirectories are shared between the members of the corresponding workgroup. Any file or document that Amelia stores in one of these subdirectories can be accessed by all other members of that particular workgroup. In Amelia's case she can share files with Freddie, by storing the files in the subdirectory 'janitors'. She can also share files with Albus, by storing the files in the subdirectory 'principals'. Note that it is not possible for Freddie to access files in the 'principals' subdirectory. Albus has no access to the files in the 'janitors' directory. Access is strictly limited to members of the workgroup. This mechanism works in two directions. Every file or document that Amelia saves in the 'staff' directory is available to any staff member. Any file or document that is stored in the 'staff' directory by another staff member is available to Amelia. It is also possible to edit the files originally stored there by other members of the workgroup. However, it is not possible for more users to edit the same file or document at the same time. NOTICE: Access to these shared workgroup directories is granted only during the time the user account (here: 'acackl') is a member of the workgroup(s) (here: 'janitors', 'principals' and 'staff'). If the user account is modified in such a way that it is no longer a member of a particular workgroup, the corresponding subdirectory in 'My Documents' is removed and access to the shared workgroup documents is no longer possible. This works the other way too: if a user account is made member of an additional workgroup, say 'jubilee' (the committee to organise the 50th aniversary of the school), a subdirectory 'jubilee' is added to the 'My Documents' directory of that user and all shared documents of that workgroup become instantly available to the user. Apart from these three pre-defined subdirectories, Amelia has some documents in her 'My Documents'. She has also created some personal subdirectories in order to organise her documents and files: 'Personel records' and 'Parents'. These subdirectories can contain files and documents and also more subdirectories. The files and documents that are stored in these directories 'Personel records' and 'Parents' are Amelia's personal files. That is: nobody except user 'acackl' is able to see or use these files and documents. Also, the documents 'Birthday list' and 'Library' and 'Guidelines' and 'Minutes 9 dec 2005' are strictly personal. Only the files and documents that are stored in one of the 'workgroup' directories can be accessed by others. If Amelia were to share the document 'Birthday list' with say Albus, she would need to copy the document to the subdirectory 'principals'. NOTICE: If you want to share files or documents with others you must either copy the files into the shared directory or use the Save As... function in the application that you use to create or modify the file or document. If you move the file into a shared directory, the other members of the workgroup will not be able to use this file. This is a known issue, currently without a good fix. If you really need to move a personal file to a shared directory, you should still copy the file to the destination and subsequently remove (delete) the original. This section discusses the 'My Documents' that belongs to Helen Parkhurst, the teacher of grade 3. Helen is a member of the workgroup 'staff' (just like Amelia Cackle, see section 2.1 Personal documents and shared documents above). She is also a member of the workgroup 'faculty', just like all the other teachers at the Exemplum Primary School. Finally she takes part in the Healthcare Committee together with her colleagues Lev Vygotski and Maria Montessori and therefore she is a member of the 'healtcare' workgroup. When Helen has successfully logged on to the network (see section 2. 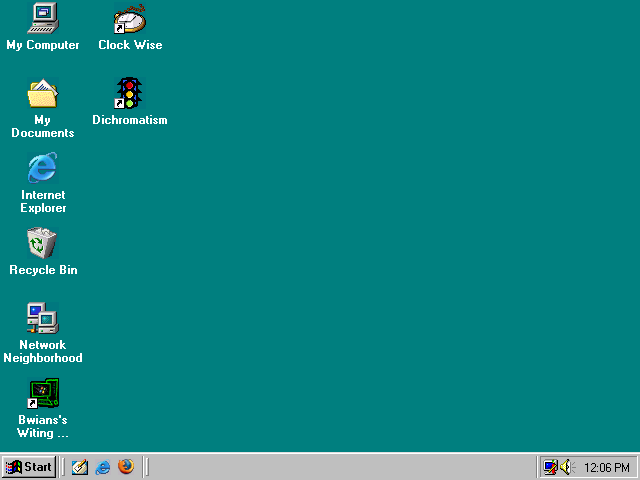 Windows networking logon in chapter X. Logging in and out), she will see her personal Desktop, as illustrated below. Helen's Desktop contains shortcuts to various application programs (Mozilla Firefox, Irfan View, Open Office, etc.). There is also an icon labeled 'My Documents'. After opening 'My Documents', e.g. by double-clicking the icon, the contents of Helen's 'My Documents' are displayed. This is illustrated in the image below. The image shows the directories associated with the workgroups in which Helen participates: 'faculty, 'staff', 'healthcare'. These directories can be used to share files and documents with other members of these workgroups. See section 2.1 Personal documents and shared documents above for more information. 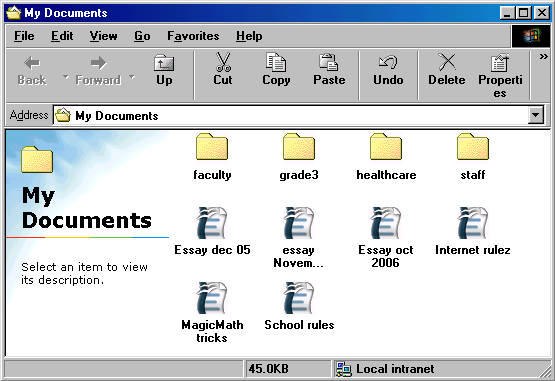 There are also some documents such as 'Essay dec 05' and 'MagicMath tricks'. These documents are Helen's personal documents and they are not visible to anyone except Helen; these documents are not shared. The 'My Documents' directory also contains a subdirectory labeled 'grade3'. This is Helen's gateway to the 'My Documents' directory of the pupils of grade 3. Because Helen Parkhurst is the teacher of grade 3, her account was setup in such a way that it was connected to the nest account used by the pupils of grade 3. This was done by the local systems administrator or the ICT coordinator at the time the account 'hparkh' was created. Note that the connection between the teacher 'hparkh' and her pupils, via the account 'grade3', could have been added later on; it was not necessary to do this at the time the account 'hparkh' was created. The effect of this connection between account 'hparkh' (Helen Parkhurst) and account 'grade3' (Pupils in grade 3) is that 'hparkh' is able to access files that belong to 'grade3' but that 'grade3' is not able to access files that belong to 'hparkh'. Also, all files of 'grade3' are accessible for 'hparkh'; there are no 'personal' files that are accessible by 'grade3' only. This is a different way to access files compared to the way shared files are handled in workgroups. In the case of simple workgroups (e.g. the 'healthcare' workgroup mentioned earlier), all members have equal access rights to the shared files and documents. You could say that this is a case of sharing files between peers. In the case of a teacher account linked to the pupil's nest account, the teacher has access rights to all files and documents of the pupils. The opposite is not true: no pupil has access rights to any personal files of the teacher. You could say that the teacher has the role of a supervisor. After opening the subdirectory 'grade3' in the 'My Documents' of 'hparkh', the contents of that subdirectory is displayed, as illustrated below. The contents of this directory is exactly the same as the contents of the 'My Documents' directory of user 'grade3' (see section 2.3 Working with documents for pupils using a nest account below). The directory contains 9 pre-defined subdirectories. Each of those subdirectories corresponds to the 'My Documents' directory of an individual pupil of grade 3. 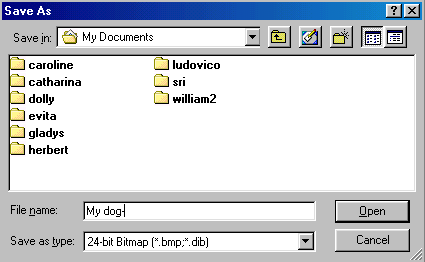 After opening the subdirectory 'herbert' in the subdirectory 'grade3' in the 'My Documents' of 'hparkh', the contents of that subdirectory is displayed, as illustrated below. The contents of this directory is exactly the same as the contents of the 'My Documents' directory of user 'herbert' (see section 2.4 Working with documents for pupils using a personal account below). Apparently this pupil, Herbert Spencer, has been working on a feline essay called 'My Cat'. Note that the teacher 'hparkh' is able to keep an eye on the work of her pupils via her own 'My Documents'. This is a very powerful feature of ServerAtSchool. The relations between the 'My Documents' of the teacher account 'hparkh', the nest account 'grade3' and the individual account 'herbert' are illustrated in the table below. This table illustrates that the meaning of 'My Documents' depends on you point of view. As an individual pupil ('herbert') you simply have your own 'My Documents', period. The nest account has access to a different 'My Documents, including the gateways to the individual pupils. Finally, the teacher has her own 'My Documents' with links to the 'My Documents' of individual pupils using the 'My Documents' of the nest account as an intermediary step. A few common applications of the features of this 'My Documents' are discussed in section 4. Common tasks with documents in a school environment below. This section discusses the 'My Documents' that belong to the nest account of the pupils of grade 3. There are nine pupils in grade 3: Caroline Lucretia Herschel, Catharina Giacomo, Dolly Madison, Evita Peron, Gladys Aylward, Herbert Spencer, Ludovico Ferrari, Sri Nisargadatta Mahara and William Bradford. The corresponding nest account is 'grade3' and there is no password associated with this account (see section 2.2 Login procedure for pupils using a nest account in chapter X. Logging in and out). 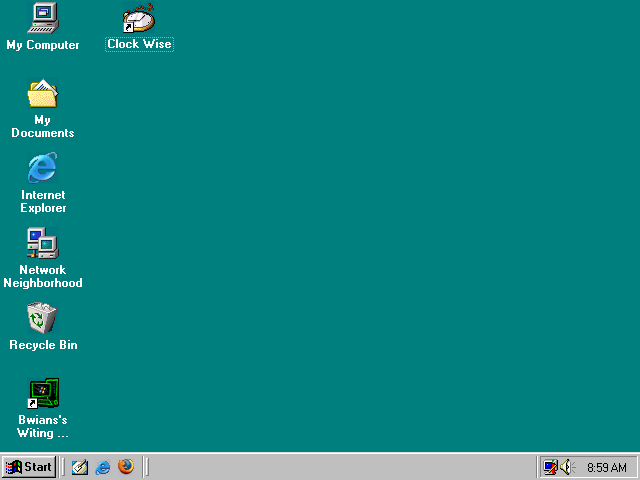 When 'grade3' has successfully logged on to the network, the following Desktop appears. 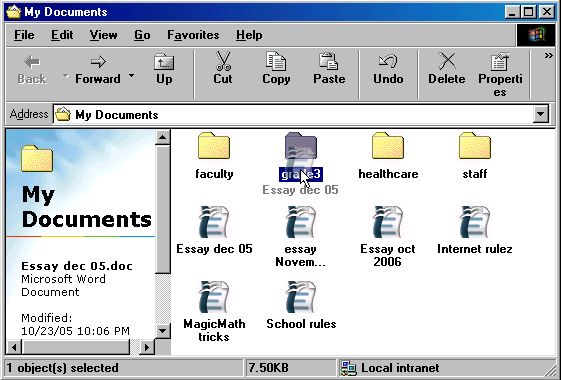 The Desktop contains shortcuts to various application programs for the pupils of grade 3 (e.g. Bwian's Witing Challenge, Clock Wise, etc.). There is also an icon labeled 'My Documents'. After opening 'My Documents', e.g. by double-clicking the icon, the contents of 'My Documents' of grade 3 are displayed. This is illustrated in the image below. 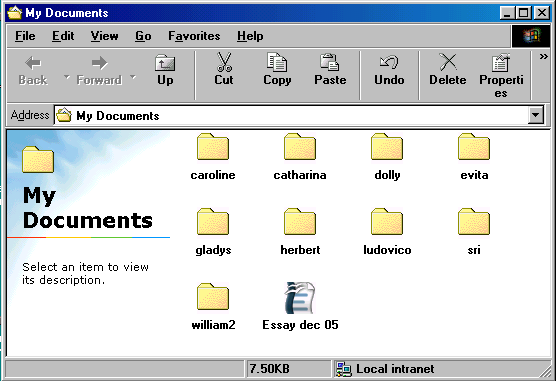 The image shows the subdirectories of 'My Documents' which are associated with the pupils in grade 3: 'caroline', 'catharina', 'dolly', 'evita', 'gladys', 'herbert', 'ludovico', 'sri' and 'william2'. Each of these subdirectories is a gateway to the 'My Documents' of the corresponding individual pupil account. That is, the directory 'herbert' contains the personal documents and files of Herbert Spencer, the directory 'caroline' holds the personal files and documents of Caroline Lucretia Herschel, etc. The teacher of grade 3, Helen Parkhurst (userid 'hparkh'), also has access to the 'My Documents' of 'grade3', see section 2.2.3 Accessing 'My Documents' of a nest from a teacher account above. 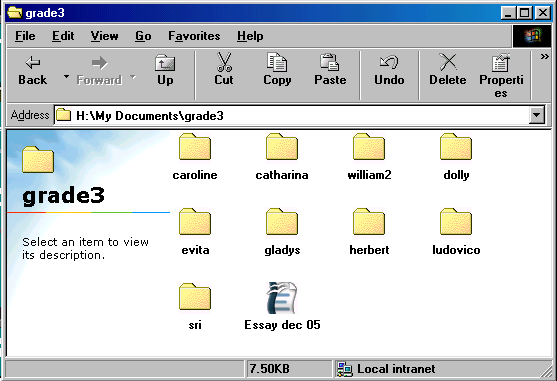 After opening the subdirectory 'herbert' in the 'My Documents' directory of 'grade3', the contents of that subdirectory is displayed, as illustrated below. Herbert has created that document while he was logged on using the 'grade3' account. 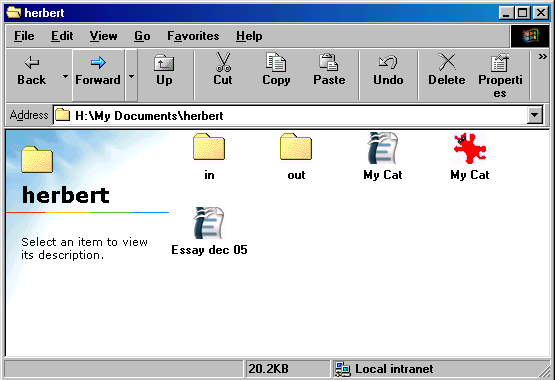 He did this by using the Save As... function in the word processor and selecting 'My Documents' and then 'herbert' and then entering the filename 'My Cat'. Note that the teacher 'hparkh' is able to keep an eye on the work of her pupils, including Herbert, via her own 'My Documents'. This is a very powerful feature of ServerAtSchool. Also, anyone using the account 'grade3' can access any file in the subdirectories. This may sound strange and insecure but it is in fact a feature. Usually there are rules in the classroom about not messing with other pupils' exercise books and other belongings. There is no good reason why such rules should not apply to electronic belongings. This section discusses the 'My Documents' that belong to the individual account 'herbert' of a pupil of grade 3, Herbert Spencer. After succesfully logging on to the network (see section 2.3 Login procedure for pupils using an individual account in chapter X. Logging in and out), Herbert will see the following Desktop. The Desktop contains shortcuts to various application programs for this individual pupil of grade 3: Bwian's Witing Challenge, Clock Wise, etc. There is also an icon labeled 'My Documents'. NOTICE: The Desktop of this individual pupil is almost the same as the Desktop of the 'grade3' account. The difference is that Herbert requires access to a specific Remedial Teaching program called 'Dichromatism'. This is the main reason to give Herbert individual access to the network in the first place. His class mates are all using the 'grade3' account to logon to the network and get the Desktop for 'grade3' (see section 2.3 Working with documents for pupils using a nest account above). After opening 'My Documents', e.g. by double-clicking the icon, the contents of 'My Documents' of account 'herbert' are displayed. This is illustrated in the image below. The image shows the subdirectories of 'My Documents' which are associated with this pupil in grade 3: 'in' and 'out'. 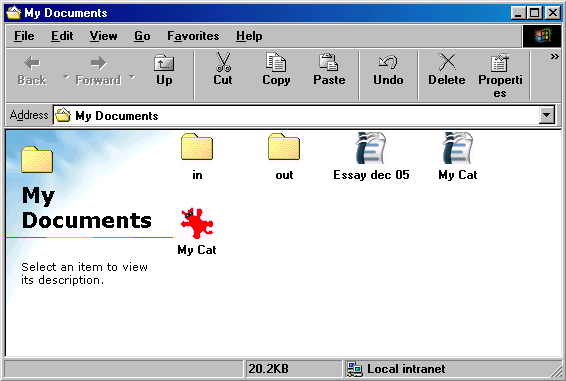 Also this directory holds some files, such as 'My Cat'. These are the personal documents of Herbert. However, because Herbert is a pupil in grade 3, anyone using the account 'grade3' can access Herbert's files and documents in his 'My Documents'. Furthermore, the teacher of grade 3, Helen Parkhurst, can keep an eye on Herbert's files, via her own 'My Documents', using the gateway to the 'My Documents' of the nest account as an intermediary step. A school is a learning environment which means that mistakes can and will be made. For instance, every year in grade 3 the Exemplum Primary School starts lessons in word processing and every year pupils loose their precious first essay. A safe learning environment should prevent the unwelcome side effects, such as loss of motivation. Making these kind of mistakes are by no means limited to the younger pupils; the elder pupils and teachers sometimes lose documents too. Behind the scenes the ServerAtSchool server makes backups of all user files and documents. This is done every hour during school hours (usually on weekdays between 08:00 in the morning and 18:00 in the afternoon). These backup copies of files and documents can be restored by the users themselves; there is no need for the help of the local systems administrator or the ICT coordinator in this matter. The hourly backup even keeps 'generations' of backup copies. That is: not just the previous version of a document is saved but also the version before that and the version before that, etc. Section 3.1 Organisation of hourly backups discusses the structure of the special backup directory tree and the associated directory H:\My Backups for every user. Section 3.2 Procedure for restoring a backup copy provides a step-by-step instruction for restoring a lost document. This procedure applies to either a teacher, a nest or an individual pupil. NOTICE: The hourly backup system only works during school hours. While working at home in the evening or in weekends, no hourly backups are made. The mechanism of hourly backups and the associated directory structure is the same for all users. It is illustrated in this section using the account of Helen Parkhurst (userid 'hparkh'), teacher of grade 3 at the Exemplum Primary School. When 'hparkh' opens 'My Computer', e.g. 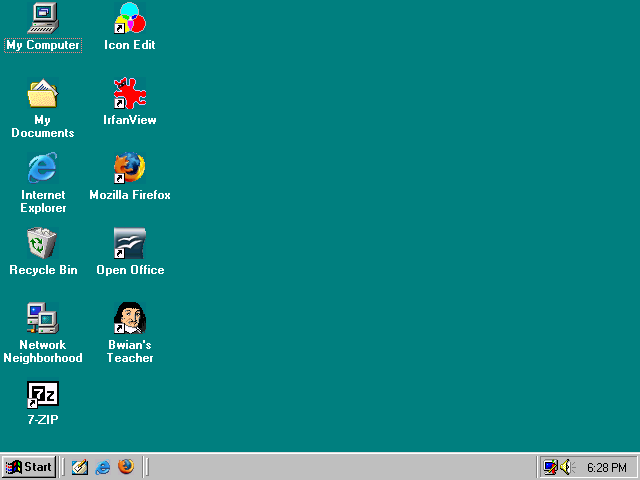 by double-clicking the corresponding icon on her Desktop, the following window is displayed. This window shows various drives, e.g. the floppy drive A:, the CD-ROM player D: and the virtual CD-ROM player K:. The most important drive, however, is drive H:. This drive equates to the user's home directory on the server. This is indicated by the label 'Hparkh on 'Server' (H:)'. Drive H: contains all the user's documents and files. The H: drive also holds the personal settings of a user (the so-called 'profile') and the backup copies of the user's documents and files. After opening the H: drive, e.g by double-clicking the appropriate icon, the following window is displayed. The H: drive of 'hparkh' contains three subdirectories. 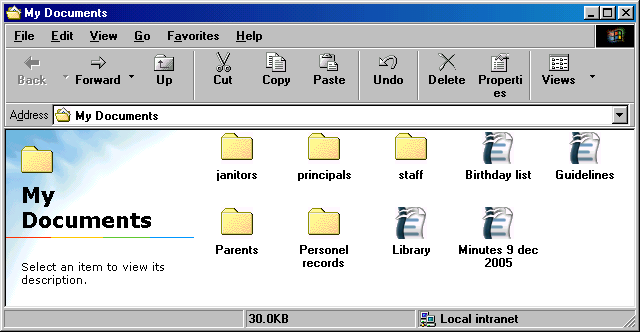 This directory corresponds to the 'My Documents' icon on the Desktop. This is the place where Helen's documents and files are stored. This is discussed in great detail in section 2. Managing 'My Documents' above. This directory holds all hourly backups of Helen's personal and shared documents and files. These backup copies of documents and files are read-only. That means that a user can not delete the hourly backups, either by accident or on purpose. This is a security feature. This directory holds the personal settings (the personal profile) for a user. Depending on the school policy this directory may or may not be visible. Because Helen Parkhurst is a member of several workgroups and also the teacher of grade 3, she has various pre-defined subdirectories in her 'My Documents' such as 'healthcare' and 'grade3'. This is explained in section 2.2.1 Viewing the contents of 'My Documents' above. If Helen Parkhurst explores drive H: with Windows Explorer, she will see an overview of the directory tree structure under her 'My Documents' like the illustration below. The left hand pane shows a lot of directories and subdirectories. You can clearly recognise the directories '.profile' and 'My Backups'. The tree starting at 'My Documents' is also partly visible: the subdirectories 'grade3' and 'staff' are opened and so is the subdirectory 'herbert' within 'grade3'. 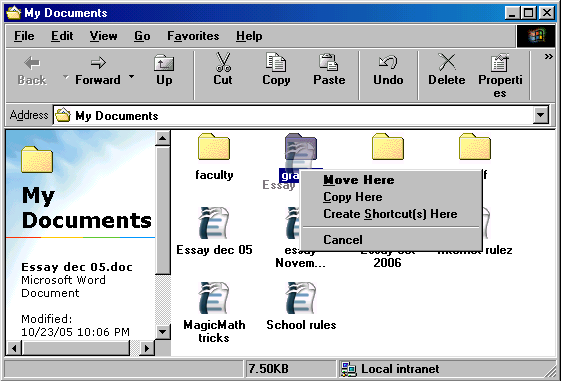 The contents of the 'My Documents' directory is visible in the right hand pane. The image below shows the directory tree under 'My Backups'. Note the difference between the contents of the address bar; the image above shows 'H:\My Documents' and the image below shows 'H:\My Backups\My Documents'. If you closely compare both images, you see that the structure of the directory tree under 'H:\My Documents' is identical of that under 'H:\My Backups\My Documents'. Please note that this identical structure extends to documents shared within a workgroup (e.g. 'H:\My Backups\My Documents\healthcare\Strategy 2005-2006') and even to backups of pupils' documents (e.g. 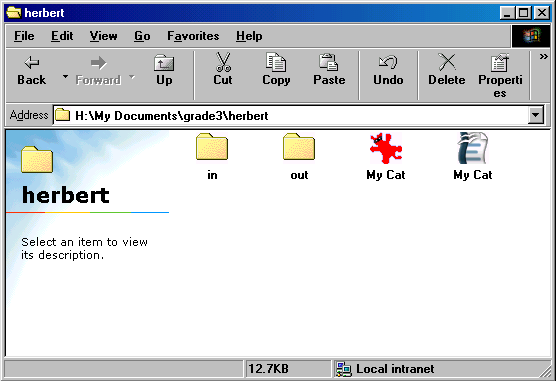 'H:\My Backups\My Documents\grade3\herbert\My Cat'). At the same time only members of a workgroup can access the backup copies of workgroup documents and files. There is a difference concerning the contents of the directories in the two directory trees. 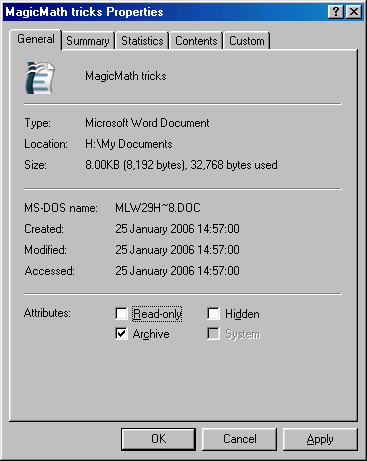 For instance, the directory 'H:\My Documents' contains a document called 'MagicMath tricks'. This document has been modified a couple of times. Every time the hourly backup process detected that the document had changed, a new backup copy was made. In this example there are three backup copies of this particular document. All these backups are stored in 'H:\My Backups\My Documents'. The names of the documents are 'MagicMath tricks', 'MagicMath tricks-60125-1100' and 'MagicMath tricks-60125-1213'. The most recent backup copy of the document is 'H:\My Backups\My Documents\MagicMath tricks'. The name of that backup copy is the same as that of the original. The older backup copies were renamed by appending a postfix to the original name. The postfix added to the names of the older backup copies always consists of a dash '-' followed by a 5-digit number, another dash '-' and a 4-digit number, for instance '-60125-1100'. The first number (here: '60125') is constructed automatically based on the modification date of the backup. The first digit (here: '6') identifies the year within the decade ('6' is '2006', '2016', ...; '7' is '2007', '2017', ..., etc.). The next two digits (here: '01') identify the month ('01' is January, '02' is February, etc.). The last two digits (here: '25') identify the day of the month. The second number (here: '1100') is constructed automatically based on the modification time of the backup. The first two digits (here: '11') correspond the the modification hour, using a 24-hour clock. The last two digits (here: '00') correspond to the modification minute. The effect of this naming scheme is that all backup copies of a document are all grouped together in a list ordered by name. Furthermore, the older backups are ordered by age because of the date and time information in the postfix. Also the names of the backups are in a human readable format. Together this makes it easy to find an backup copy of a document. This is a very comforting idea at a moment where you just discoverd your hard work appears to have vanished into thin air. NOTICE: It is impossible to keep hourly backups 'forever' because eventually all the storage space in the server computer would be filled with backup copies. Large documents that are modified on a regular basis occupy a lot of storage space in 'My Backups'. In order to reclaim this storage space, at some point in time the hourly backups are deleted by the local systems administrator. As a rule this is done once a year, just before a new schoolyear begins. Note that the local systems administrator will not delete the original documents. As stated before, 'losing' documents and files is a fact of life in a school environment. The hourly backup does a good job of minimalising the negative side effects. When you or your pupils have lost material, please take the following steps. Relax. Do not panic. Ease the pupil and have cuppa yourself. Locate the backup copy of the lost file in 'My Backups'. Copy the backup copy of the lost file to its original location. Remove the read-only attribute of the restored file. (optional) Change the name of the restored file to the original name. Here is a step-by-step procedure for recovering a document from 'My Backups'. This procedure is illustrated with the document 'MagicMath tricks' that somehow has disappeared from the 'My Documents' directory of Helen Parkhurst (userid 'hparkh'). The goal of the procedure is to restore a backup copy of the document. If you wish to restore a backup copy of a document, you should take the following steps. 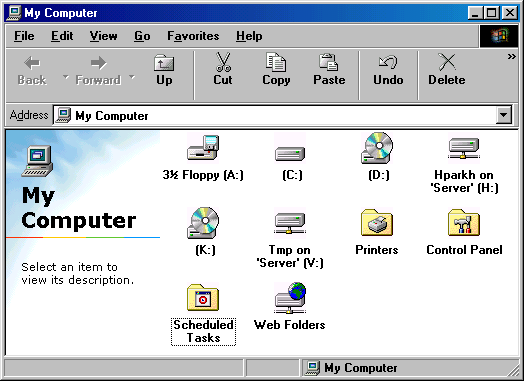 Open 'My Computer' by double-clicking the corresponding icon on the Desktop. The following window will be displayed. Open drive H: by double-clicking the icon labeled 'Hparkh on 'Server' (H:)'. Three directories: '.profile', 'My Backups' and 'My Documents' will be displayed in the window, as illustrated below. Descend into the 'My Backups' directory by double-clicking the appropriate icon. The window will now display the contents of the 'My Backups' directory. Please make sure that you have descended into the correct directory by checking the contents of the address bar. It should read 'H:\My Backups'. Further descend into the 'My Documents' subdirectory by double-clicking the appropriate icon. The window will now display the following. Please make sure that you have descended into the correct directory by checking the contents of the address bar. It should read 'H:\My Backups\My Documents'. (optional) If you want to have a better view of all the subdirectories, documents and files, you can change the layout of the window by navigating to: View | List in the menu at the top of the window. In that case the following will be displayed. The directory listing clearly shows three different backup copies of the lost document: 'MagicMath tricks', 'MagicMath tricks-60125-1100' and 'MagicMath tricks-60125-1213'. You have found the lost document. Now you have to copy the desired backup to the original location. See section 3.1.3 Generations of copies in 'My Backups' for an explanation of the postfix added to the older backup copies of the document. Copy the backup back to 'My Documents', using cut-and-paste. Take the following steps. With your mouse, right-click on the name of the backup copy you wish to restore (here: 'MagicMath tricks', the latest backup that was made). A pop-up menu will open. In the pop-up menu select 'Copy'. A copy of the document is now present in the clipboard. The pop-up menu will close. Open 'My Documents' by double-clicking on the appropriate icon on the Desktop. (optional) Descend into the subdirectory where you wish to restore the document. Right-click on an empty area inside the window. A pop-up menu will open. Select 'Paste' from this pop-up menu. The document is copied from the clipboard to its destination and the pop-up menu will close. After a while the restored document becomes visible. (optional) If you want to have a better view of all the subdirectories, documents and files, you can change the layout of the window by navigating to: View | List in the menu at the top of the window. Remove the read-only attribute of the restored document. Take the following steps. With your mouse, right-click on the document you just restored. A pop-up menu will open. Select 'Properties' from this pop-up menu. The 'Properties' window will open. On the opening tab 'General', at the bottom you find 'Attributes'. A mark is set at 'Read-only'. Unmark 'Read only'. You will now see the following. At the bottom of the 'Properties' window, press the [OK] button. The window will close and the document will no longer be read-only. (optional) If you have just restored an older backup copy, the name of the restored document will still show the postfix, e.g. '-60125-1100' or '-60125-1213'. You can get rid of the postfix by changing the name of the document. Take the following steps to rename the document. Select 'Rename' from this pop-up menu. The name of the document will be shown in 'selected' form and the text cursor is positioned at the end of the document name. Hit [CursorRight] just once. The name of the document is no longer 'selected' and the text cursor is still positioned at the end of the document name. Hit [BackSpace] exactly eleven times. This will delete the postfix (4 digits, a dash, 5 digits and another dash). Hit [Enter] to confirm the change of the name. This section discusses a few tasks that are very common in a school environment. Here is a realistic example. A teacher (Helen Parkhurst, userid 'hparkh') has prepared an assigment for grade 3 in her own 'My Documents'. She now wants to copy the document she prepared to a place where the pupils of grade 3 can access the document. Note that the pupils can not access the teacher's 'My Documents'. Therefore the document needs to be copied to a directory that the pupils can access, i.e. to the 'My Documents' directory of 'grade3'. For user 'hparkh' this is equivalent to 'H:\My Documents\grade3', see section 2.2.3 Accessing 'My Documents' of a nest from a teacher account above. If you want to copy the document 'Essay dec 05' from your 'My Documents' to the 'My Documents' of your pupils in 'grade3', you should take the following steps. Open your 'My Documents' by double-clicking the appropriate icon on your Desktop. The following window appears. 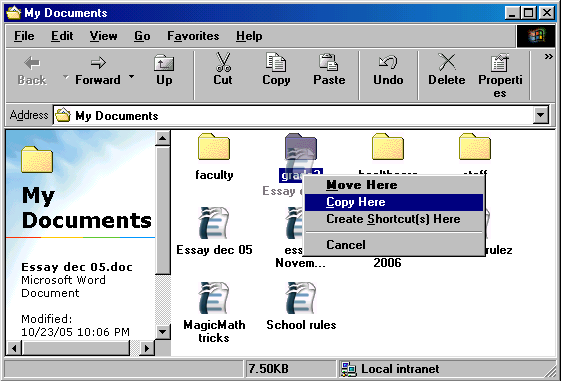 Select the document 'Essay dec 05' by moving the mouse pointer to the document icon and pressing and holding down the right hand mouse button. The document icon is now displayed in a different colour, as illustrated below. Now, while still holding the right hand button, move the mouse pointer to the subdirectory labeled 'grade3'. A 'ghost'-like image of the document icon travels along. This procedure is known as 'dragging the document'. When the 'ghost' image of the document is hovering over the directory 'grade3', release the right hand mouse button. A pop-up menu appears, as illustrated in the image below. Move the mouse pointer to the menu option 'Copy Here'. This option will be shown in a different colour, as illustrated below. Click the left hand mouse button. The document will be copied into the directory 'grade3'. This is sometimes called 'dropping' the document. The document 'Essay dec 05' is now copied to a directory where the pupils can access the document when they are logged on to the network using the nest account 'grade3'. The method described above is often called drag-and-drop. Note that pupil Herbert Spencer (or any other pupil of grade 3 for that matter) can not access this document if he is logged on to the network using his personal account. There is no problem when the pupil uses the 'grade3' account; the document would be located in the 'My Documents' directory. NOTICE: Do not use the 'Move Here' option. By moving the document it disappears from your own directory and the original will reside in the directory 'grade3'. This is asking for trouble: if one of the pupils decides to delete the document 'Essay dec 05' or moves it to a personal directory, either by accident or on purpose, the document is no longer available. You would then have to resort to restoring a backup copy of it in your own 'H:\My Backups\My Documents' or perhaps in your 'H:\My Backups\My Documents\grade3'. NOTICE: If you want to share files or documents with other users (in this case: the pupils of grade 3), you must either copy the files into the shared directory or use the Save As... function in the application that you use to create or modify the file or document. If you move the file into a shared directory, other users accessing the file will not be able to use it. This is a known issue, currently without a good fix. If you really need to move a personal file to a shared directory, you should still copy the file to the destination and subsequently remove (delete) the original. Sometimes it is handy when a teacher, say Helen Parkhurst (userid 'hparkh') is able to distribute a document to her pupils, one copy for every pupil. This can be done using a variation of the cut-and-paste procedure discussed in section 3.2 Procedure for restoring a backup copy above. The procedure is illustrated with the document 'School rules'. This document is located in the 'My Documents' directory of teacher Helen Parkhurst. The goal of the procedure is to create a copy of this document in each of the personal directories of the pupils. If you want to copy the document 'School rules' to individual pupil's directories, you should take the following steps. Open 'My Documents' and locate the document you wish to copy. With your mouse, right-click on the name of the document you wish to copy. A pop-up menu will open. Navigate to: 'My Documents' | 'grade3'. The following will be displayed. Right-click on the subdirectory of the first pupil (here: 'caroline'). A pop-up menu will open. Select 'Paste' from this pop-up menu. The document that is present in the clipboard is now copied into the directory 'caroline' and the pop-up menu will close. Repeat the previous two steps for each of the remaining pupils. This procedure is very efficient because it does not require you to descend into a pupil's directory; you can simply paste (a copy of) the document, with minimal effort. Note that the document 'School rules' is now copied to the personal 'My Documents' directories of the pupils. This means that Herbert and Caroline and all the others have a copy of 'School rules' in their 'My Documents' when they log on to the network using their personal accounts 'herbert', 'caroline', etc. Also note that at the same time each of the pupils can access their copy of this document when they are logged on using the 'grade3' account by navigating to their own subdirectory in 'My Documents' of user account 'grade3'. A 'lost' document can be restored from 'My Backups' using the procedure discussed in great detail in section 3.2 Procedure for restoring a backup copy. However, there are two different ways to approach the problem. The first one is to log on to the network using the pupil account. That could be the account 'grade3' or even the pupil's personal account, e.g. 'herbert'. You can then hunt for the lost file in 'My Backups', together with the pupil who lost the file. This gives you plenty of opportunity to teach the pupil how to restore a lost document if it happens again in the future. The downside is that a complete walkthrough of the procedure, together with the pupil, can take some time. The second one is to use another workstation (in your classroom or elsewhere within the school) and log on to the network using your own account, say 'hparkh'. You can then quickly locate the lost document using your own 'My Backups', say 'H:\My Backups\My Documents\grade3\herbert\My Cat-60125-1428' and quietly copy it to 'H:\My Documents\grade3\herbert\My Cat'. Once you have had a little practice with restoring lost documents, you can probably do this in a snap. The downside of this approach is that the pupil will not learn anything about restoring backups and will always need your help when restoring a backup copy is necessary. There are several ways to work with shared documents. The easiest way to share documents with other members of a workgroup is to create the document in the shared directory. For example, if you are a member of the Healthcare Committee and you will be writing the document 'Strategy 2005-2006', you could take the following steps. Create a new document by navigating to: File | New. When prompted for a document name, navigate to: 'My Documents' | 'healthcare' and enter the name 'Strategy 2005-2006'. Press [OK] to confirm the dialogue. This procedure creates a new document 'H:\My Documents\healthcare\Strategy 2005-2006' that is directly visible for the other members of the workgroup. Another way to share this document with the other members of the Healtcare Committee is this. First create the document in your own, personal 'My Documents', say as 'H:\My Documents\Strategy 2005-2006'. This allows you to work in peace, with no colleagues looking over your shoulder to see what progress you are making. After you are finished you can copy the document to the shared directory ('H:\My Documents\healthcare') using either drag-and-drop as discussed in section 4.1 Procedure for copying a document to a nest directory or cut-and-paste as discussed in section 4.2 Procedure for copying a document to pupil directories. The advantage of this method is that you decide when the document is ready for peer review. The downside is that it is very easy to lose track of which version is the latest, especially when your colleagues add their comments directly to the shared document. A third method is to create a first draft of the document in your own, personal 'My Documents' directory and subsequently relocate the document to the shared directory. In this case you should use the following procedure. Create the document in 'H:\My Documents\Strategy 2005-2006'. Copy the document from 'H:\My Documents\Strategy 2005-2006' to 'H:\My Documents\healthcare\Strategy 2005-2006', either with drag-and-drop or cut-and-paste. Delete the original document in 'H:\My Documents\Strategy 2005-2006'. NOTICE: Do not use 'Move Here' option when copying. If you move the file into the shared directory, the other members of the workgroup will not be able to use this file. This is a known issue, currently without a good fix. If you really need to move a personal file to a shared directory, you should still copy the file to the destination and subsequently remove (delete) the original. This section discusses a few 'known issues' and also a few suggestions to work more efficiently with 'My Documents'. The image below shows the 'My Documents' directory of teacher Helen Parkhurst once again. This image shows that many of Helen's documents are stored in the top level of her 'My Documents' directory. Here are some ideas gathered in schools on organising files and directories. First thinking a bit about a tree structure to organise your files and documents is better than start saving files immediately. Having documents in the root (the top level) of the 'My Documents' directory easily leads to an incomprehensible collection of documents, pictures, music files, etc. In Helens case it would have made sense to create a directory 'assignments'. This would be a good place to store all the assignments for grade 3. Next year, the complete directory 'assignments' could be copied to the 'My Documents' directory of the new teacher for the new grade3. It makes sense to think of a naming convention for documents and files and more important: stick to it. One simple reason is that they more easily found when ordered in a systematic way. Here are some rules of thumb for naming files. Always give a document a name. Some word processors use the first line of text when not giving the document a name. That can be very confusing. Remember that you can use a (numeric) date as part of a name to easily order long lists of documents in a directory. Choose a name that represents the contents of the document. Do not use extremely long names for files and documents. Use subdirectories instead. There are also a few things that you should not do. Do not save files directly in the root directory of drive 'H:'. Keep it as clean as possible. NEVER save documents on the desktop. This is a bad idea. Your document will not be saved on the server but on the local machine. So, soon it will be lost, for example when a new image is copied to the workstation. Try not to move documents. Instead, copy the file and delete the original. If you give your pupils assignments, e.g. by copying the assignment once to the 'My Documents' directory of grade 3, you have to have a way to collect the results in such a way that the work of one pupil is not damaged by another pupil. 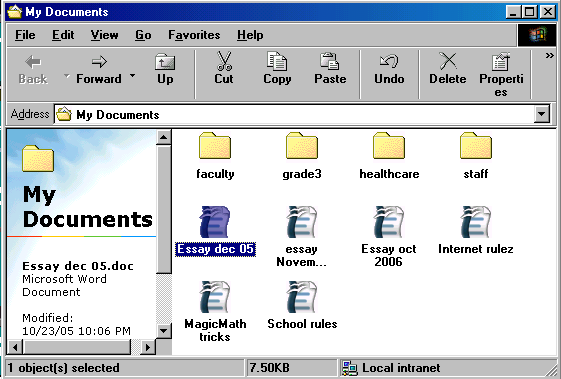 If, for example, all pupils of grade 3 are to write an essay, the assignment may be stored in 'H:\My Documents\Essay dec 05' (as seen when logged on using the grade3 account). All pupils should then copy this assignment to their own directory, e.g. to 'H:\My Documents\herbert\Essay dec 05' before working on the assigment. For Herbert it looks like this. He moves his mouse pointer over the document and left clicks once. A pop-up menu will open. He selects 'cut' by moving his mouse over 'Cut'. He clicks once. The menu disappears. He moves his mouse pointer ove the 'out' box and right-clicks once. The same pop-up menu will open; it has an extra option: 'Paste'. He selects Paste and clicks once. The menu disappears. Herbert inspects the out box to check if the document is there. Done. Back to the cat. This way the teacher, Helen Parkhurst, can collect the assignments of all her pupils by looking in their 'out' boxes. From the account 'hparkh' this would be 'H:\My Documents\grade3\herbert\out'. Sometimes it appears that work simply disappears. Say Herberts fine piece of work on cats is vanished. That is to say, the document is still there but the contents are gone. This happens often in Dutch schools due to language problems. The words for 'Save' (Opslaan) and 'Open' (Opvragen) look and sound the same for young children. Navigate to: File | Save As. The Save As window will open. (Note that Herbert is quite sure that he has navigated to: File | Open). Click [Save]. You do get a warning about overwriting files. However, Herbert is obedient and simply presses [Yes] like he always does when saving a file. His text is replaced with the empty document. The solution for this problem is discussed in section 4.3 Procedure for recovering lost documents of pupils above. Sometimes, out of the blue, a pupil has lost his personal directory, say 'evita'. After interrogation, no pupil has deleted the directory. After checking all pupils directories the missing directory is found inside another pupils directory. Neither of them has done anything wrong. It's a problem that occurs in a primary school. The explanation is as follows. Many young children do not yet have enough eye-hand coordination and/or enough developed motion control to properly move and doubleclick the mouse. This can result in 'strange' errors and 'weird behaviour' of the computer, even though the machine does exactly what it is told to do. If Evita wishes to save a document in her own directory, she has to descend into that directory. By default the 'Save As' dialogue starts in 'My Documents'. Descending to the 'evita' directory can be done by double-clicking the corresponding folder image. In reality the following may happen. She moves the mouse up (or down) a little, i.e. over the 'dolly' directory or the 'gladys' directory. She releases the left hand button of the mouse. She presses the left hand button again. She releases the left hand button again. At this point she may be under the impression that she doubleclicked on the 'evita' directory. However, if she was not fast enough, the system considers the so-called doubleclick as two separate events where the first event was even combined with a mouse movement. That would be interpreted as 'move the selected directory into the one 1 line higher (or lower) in the list of directories', followed by 'select the directory 1 line higher (or lower)'. In other words: Evita used drag-and-drop to move her own directory 'evita' into another directory (either 'dolly' or 'gladys') and subsequently selected that other directory with a single mouseclick. The effect for the untrained little user is that her directory vanishes into thin air. Not very 'userfriendly'. Therefore setting the doubleclick speed lower can result in less errors and a better 'user experience'. Having explained the cause does not bring back the lost directory. The search can take quite some time or may prove to be impossible alltogether. The better solution is to as the local systems administrator or the ICT coordinator to perform the following procedure. Start the Janitor program (documented in chapter III. Janitor). Navigate to: users and groups | modify users and groups | nests | evita. Temporarily promote 'evita' to another group, e.g. from 'grade3' to 'alumni'. Undo the temporary promotion and move 'evita' back from 'alumni' to 'grade3'. Promoting a pupil has a side effect that all of the structure involving 'My Documents' and 'My Backups' for this pupil and the corresponding grade is re-created. This also means that the directory 'evita' in the 'My Documents' directory of 'grade3' is re-created. The net result will be that Evita's directory is back. NOTICE: This cumbersome work-around will be replaced with a better solution in a future version of the Janitor program. Sometimes it is handy to have school-wide templates for creating documents with a word processor. Some word processors let you configure the location of the document templates. If you specify 'H:\My Documents\staff\templates' as the location for document templates, every staff member can easily use the school's letterhead template for outgoing letters to parents, etc. Of course this particular trick only works for staff members and not for pupils. In this chapter many aspects of 'My Documents' and the hourly backup copies in 'My Backups' were discussed. It can take some time to get comfortable with the ideas and concepts presented here. You may want to print this chapter and keep it for future reference.